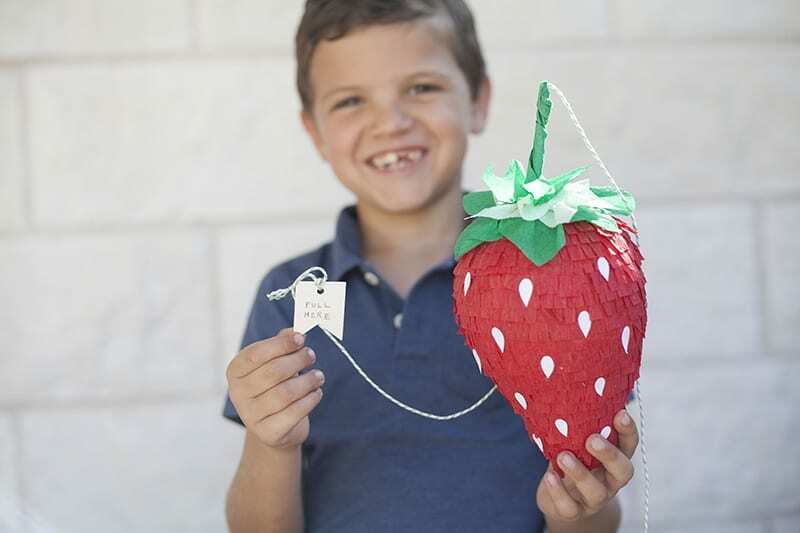 Big Piñatas are cool but personal piñatas are just the cutest. 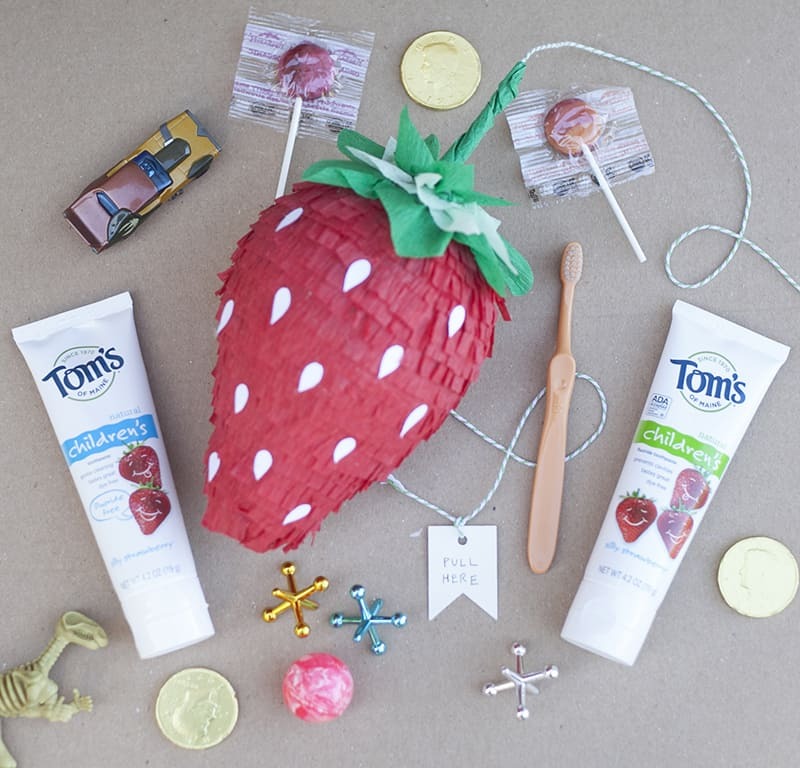 When Tom’s of Maine asked us to help them celebrate the 25th anniversary of Silly Strawberry Natural Kids Toothpaste, a DIY strawberry piñata (but cuter) felt perfect. I can’t help but feel sentimental when in comes to Tom’s of Maine. I’ve used their products since I was a little one and it’s a tradition that I’ve continued now that I have my own family. My kids were literally begging to run off with these tubes of toothpaste as I was trying to photograph them. That’s weird right? They are dying to brush their teeth. 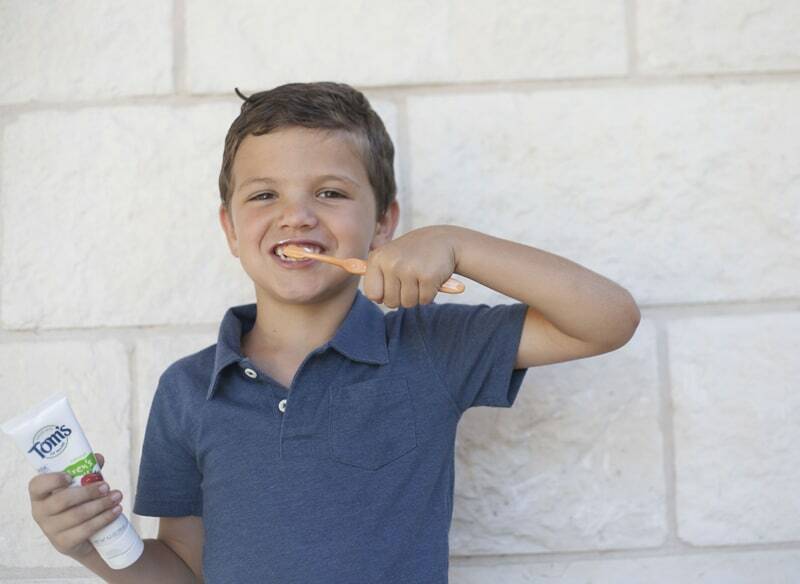 With natural ingredients like real strawberry extract, it’s no wonder that Silly Strawberry is the #1 natural kids toothpaste and the first and only natural kids toothpaste to receive the American Dental Association’s Seal of Acceptance. 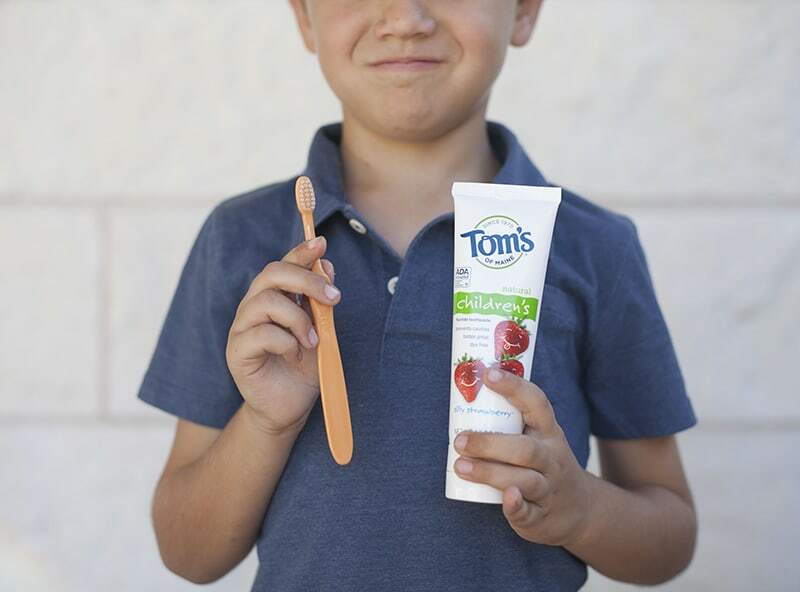 I love that Tom’s of Maine Silly Strawberry has fluoride and fluoride-free options with no artificial flavors, dyes or sweeteners that I can feel good about giving my kids and that said kids willingly, and eagerly, use. Plus, it has no animal ingredients and isn’t tested on animals. Did you know that you are supposed to brush your teeth for two minutes? 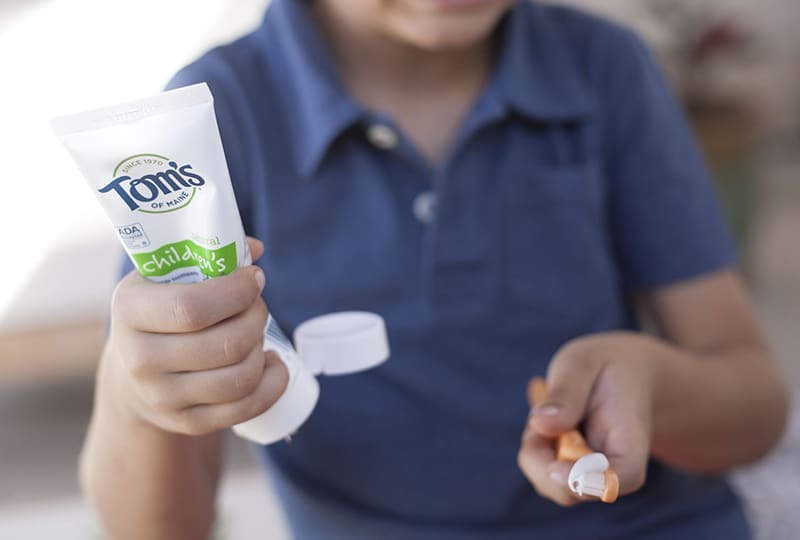 Two minutes feels like a really long time when you are brushing your teeth, especially when you are little, so I appreciate all the help I can get in inspiring them to brush. 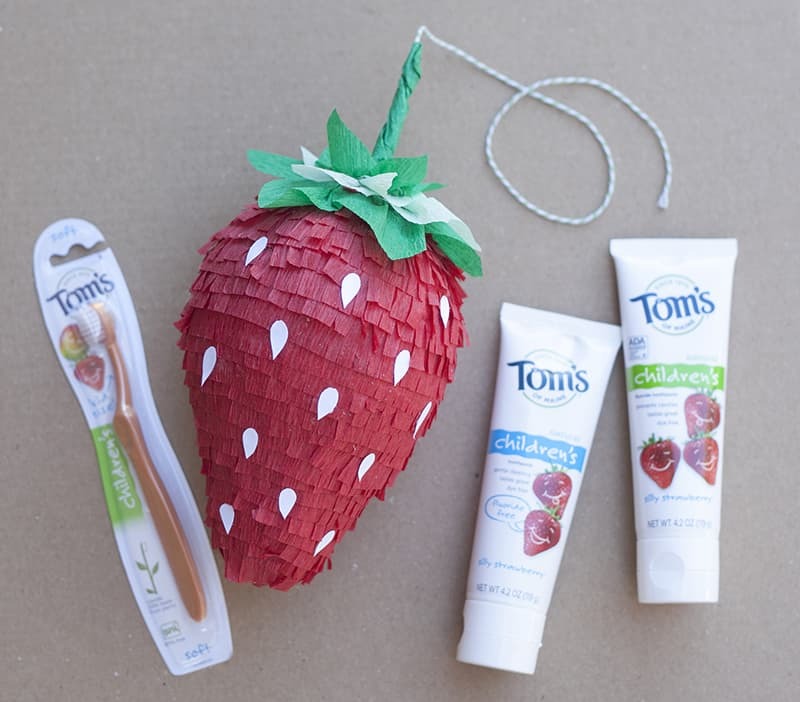 Read on for a step-by-step tutorial for a mini DIY strawberry piñata and the Silly Brushing Song (Brush Em’ Up) that Tom’s of Maine has made with artist Laurie Berkner to help remind us to brush longer. 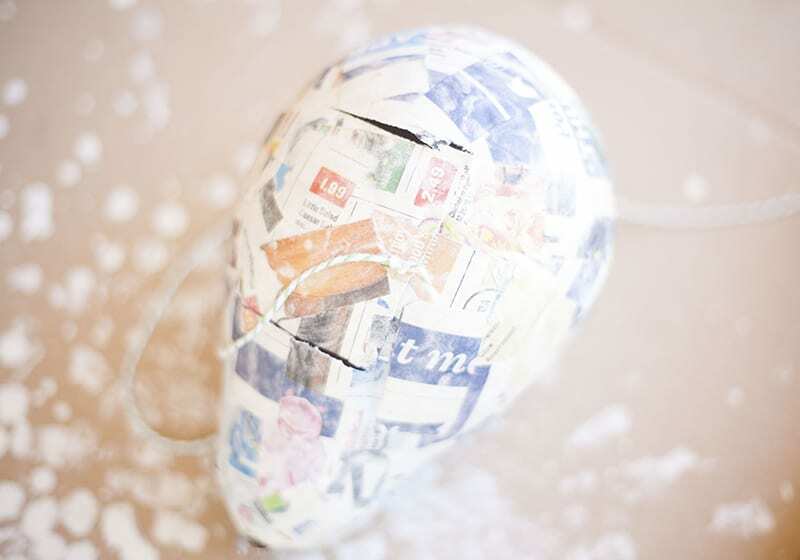 It had been a long time since I had made a piñata, the classic 1970’s way, with flour paste and newspaper. 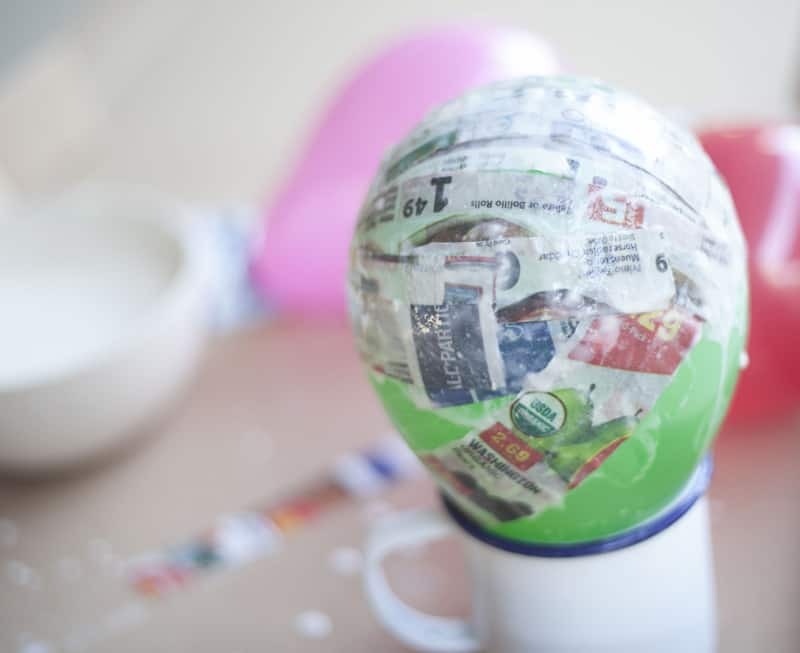 The kids were blown away by the magic of how paper mache hardens into a shell and it was a fun, messy (but not too messy) project to do as a family. 1. 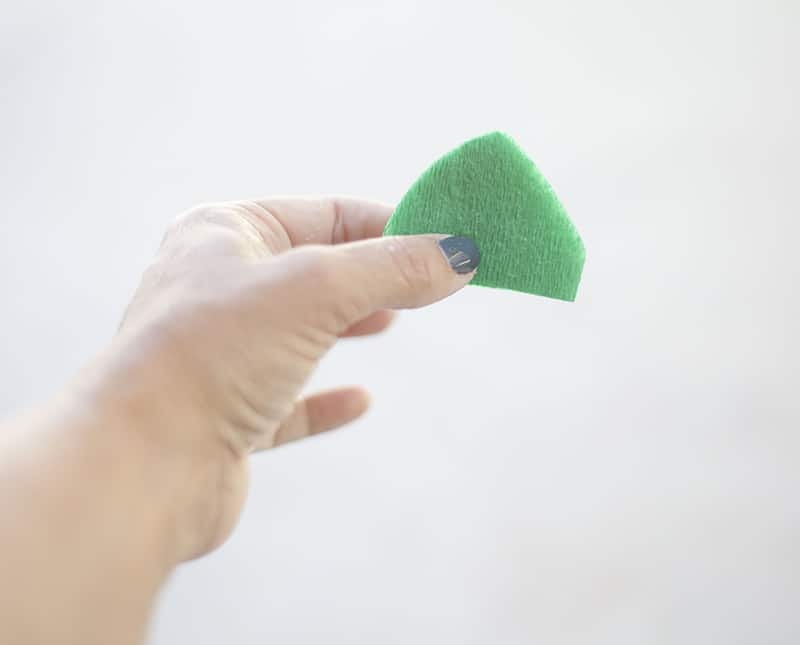 First make your flour paste. 2 parts water to one part flour. It should be the consistency of white glue. If you have pancake batter, it’s too thick. 2. 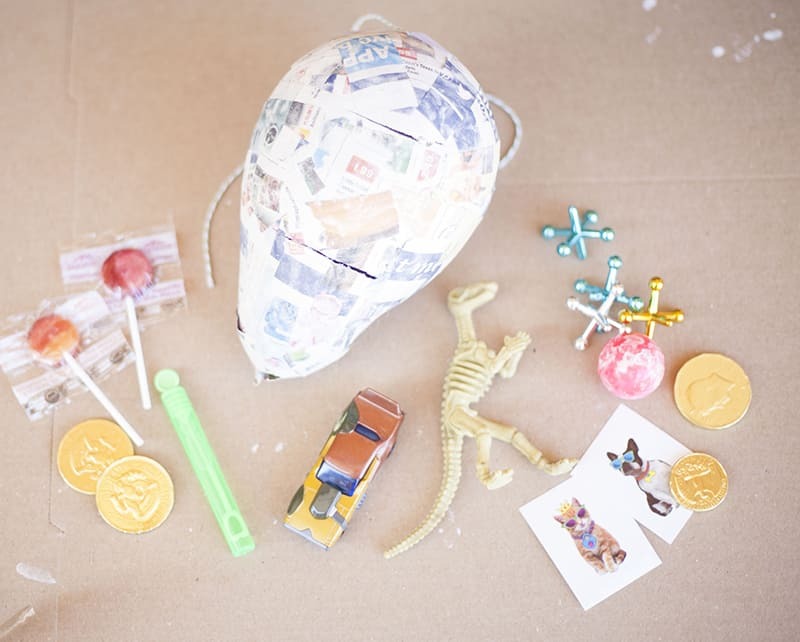 For our mini strawberry piñata, I used one of these tiny old school balloons. 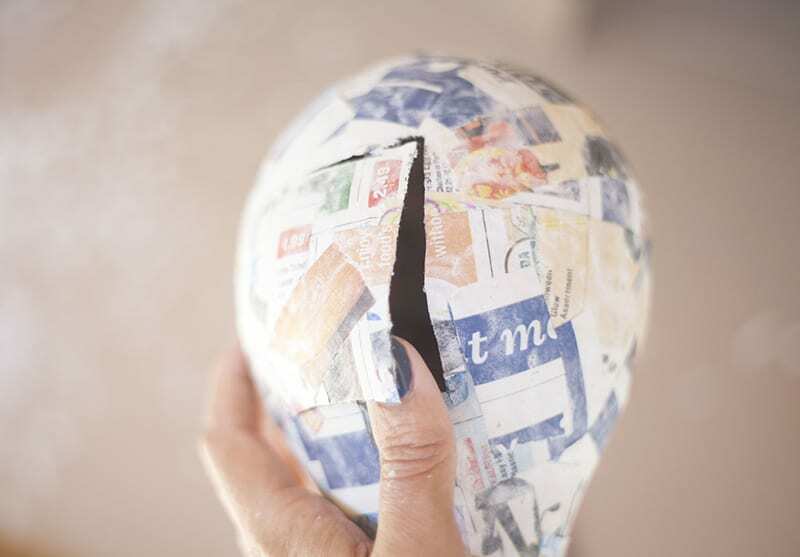 Cut strips of newspaper, or any uncoated newsprint into 1″ strips. 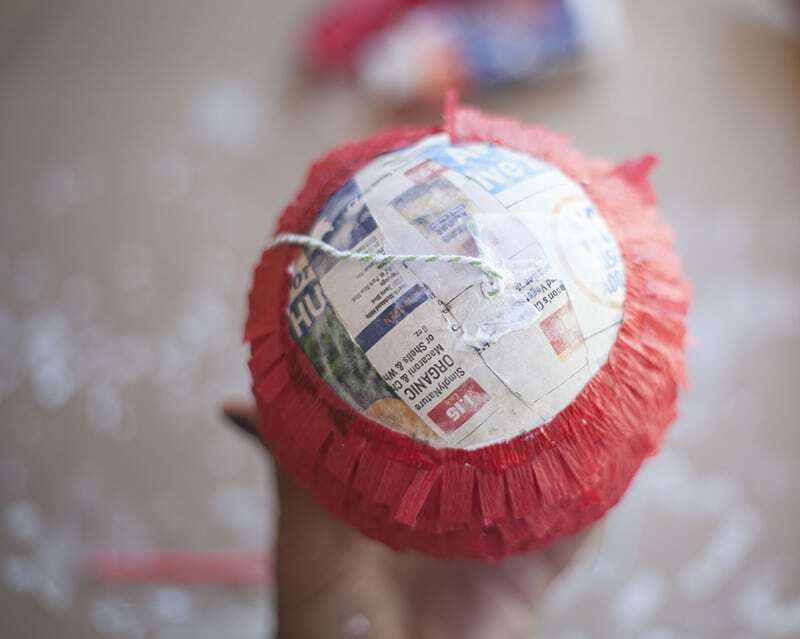 For a tiny piñata, smaller pieces of paper are better. 3. 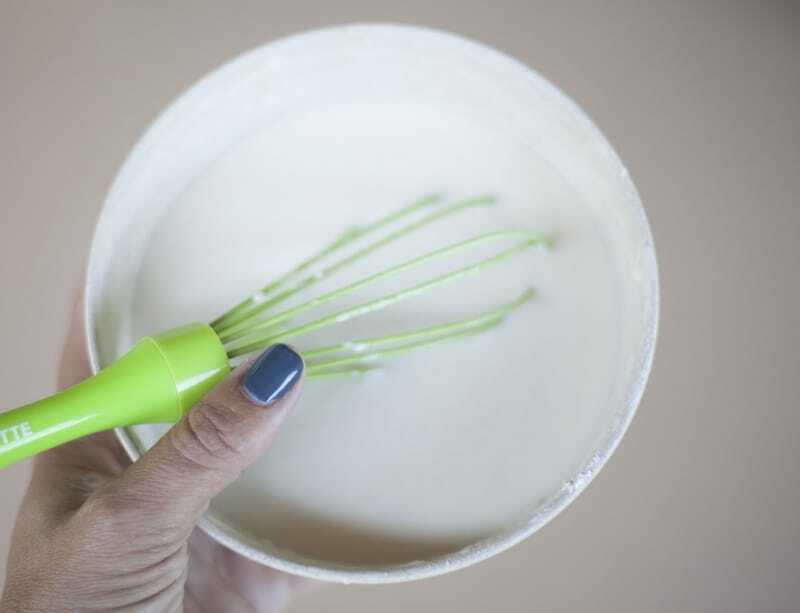 Dip a strip of paper in the paste and wipe all of the paste off with your fingers, down back into the bowl. 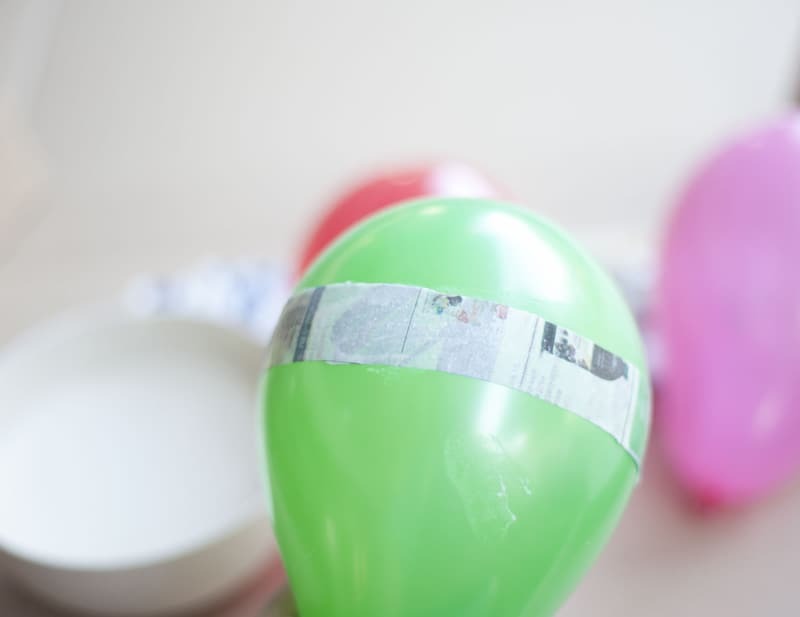 Apply the strip to the balloons. 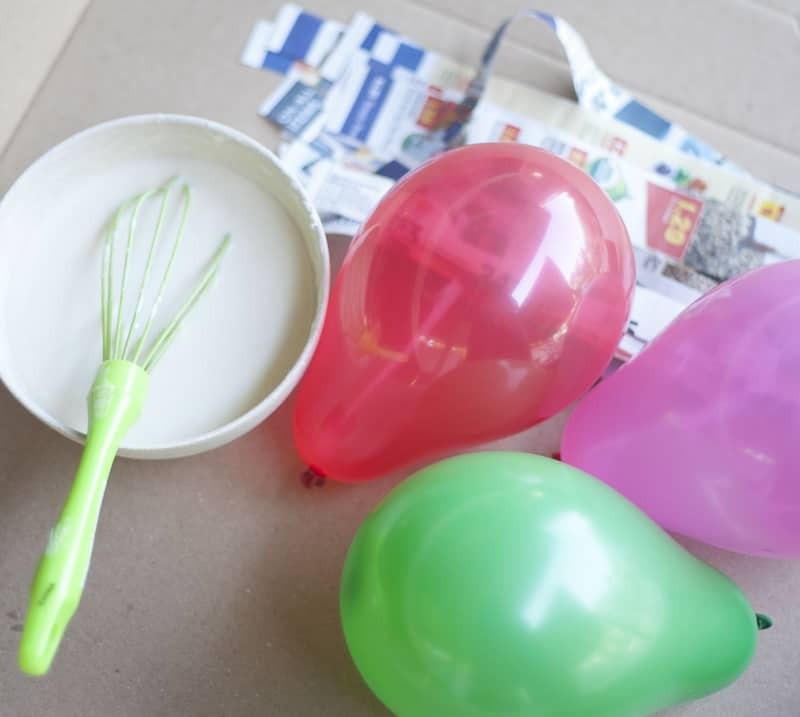 Tip: Using a cup to secure the balloon in place is really helpful. 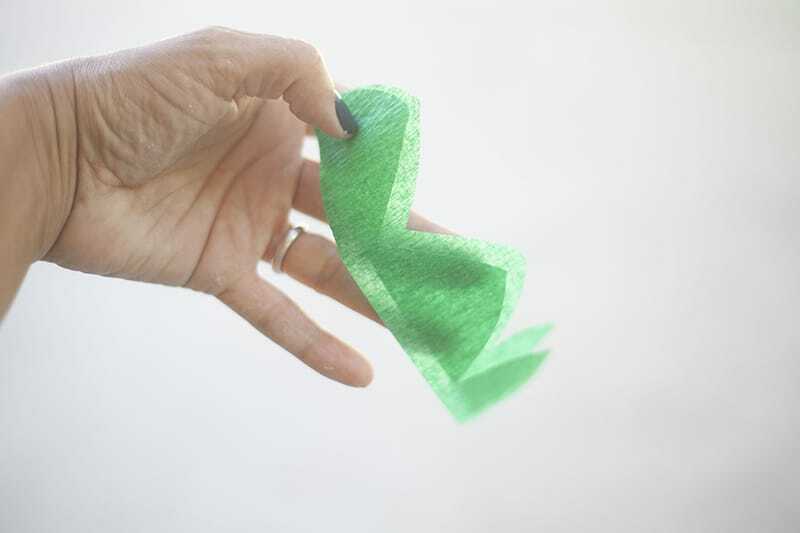 Make sure that your strips cover the entire balloon and that the strips go in different directions. 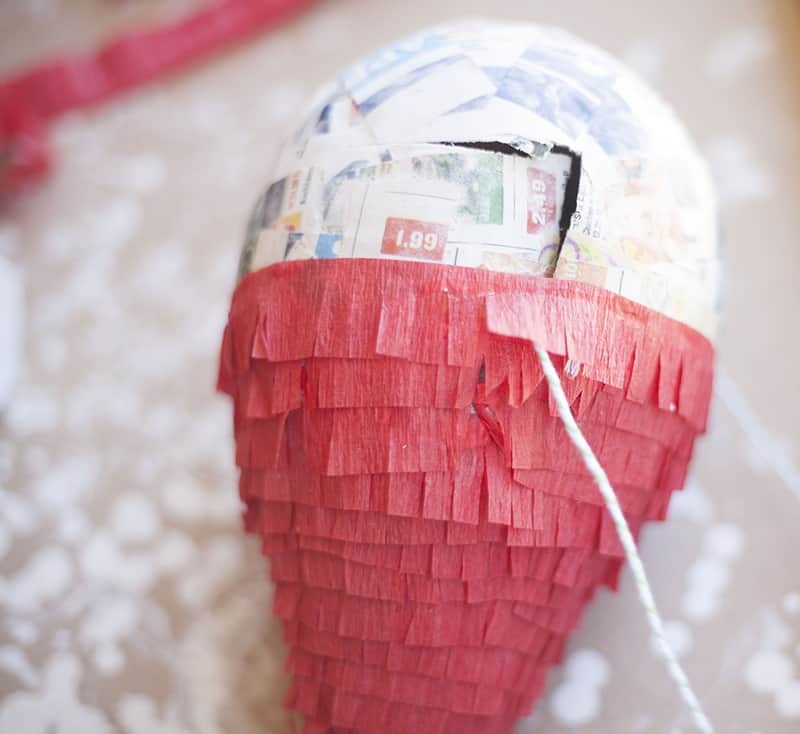 For a sturdy piñata, two coats of paper is ideal but that will take a little longer to dry. 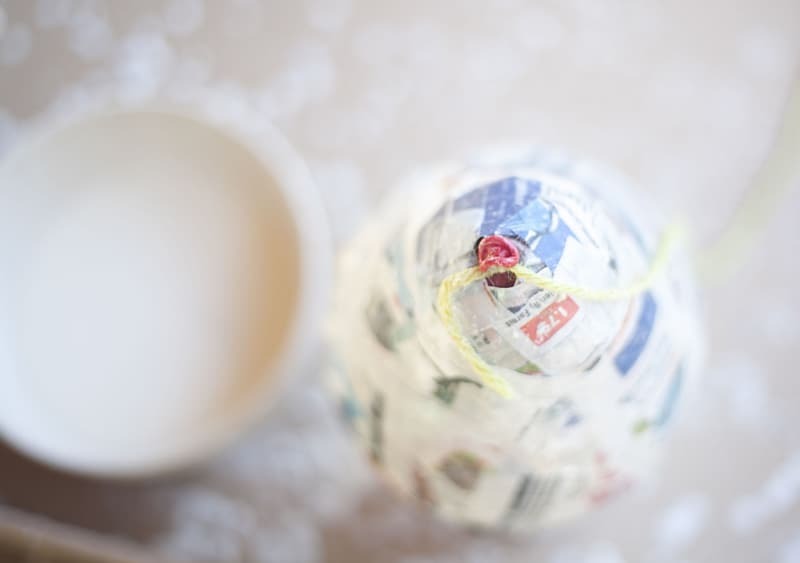 one coat of paper will give you a solid but fragile shape. 4. 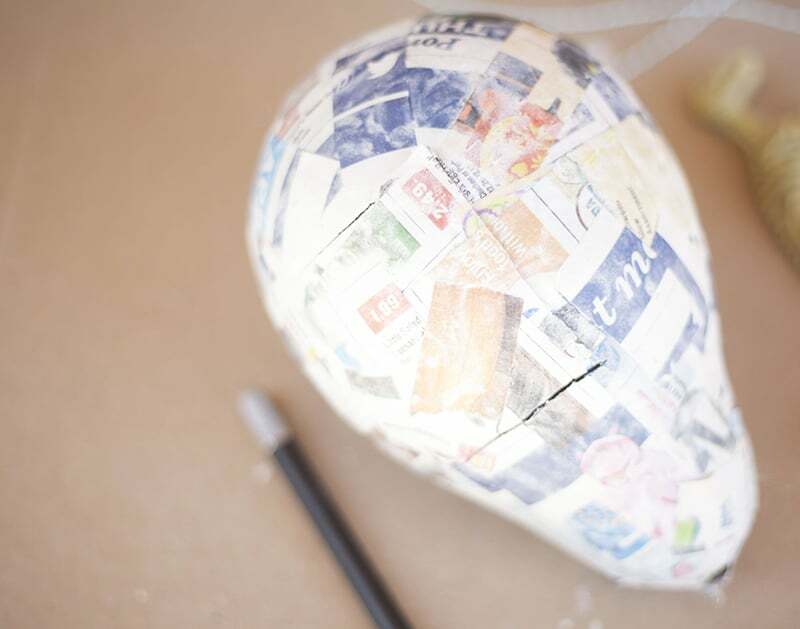 Tie some string to the knot of the balloon. 5. 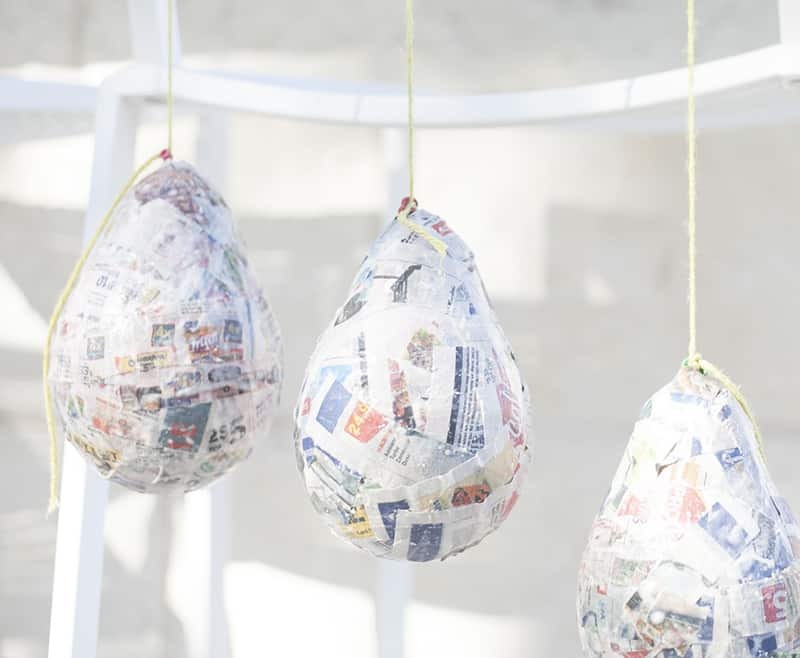 Hang to dry in a sunny, breezy location. If it’s humid or you are out of time, a hair dryer is your friend. 6. 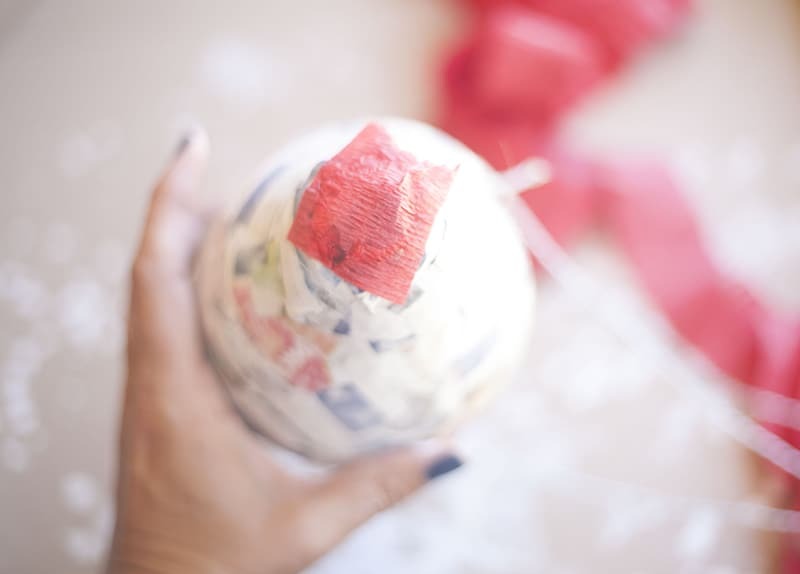 Once fully dry, pop the balloon and pull it through the opening by the string. 7. 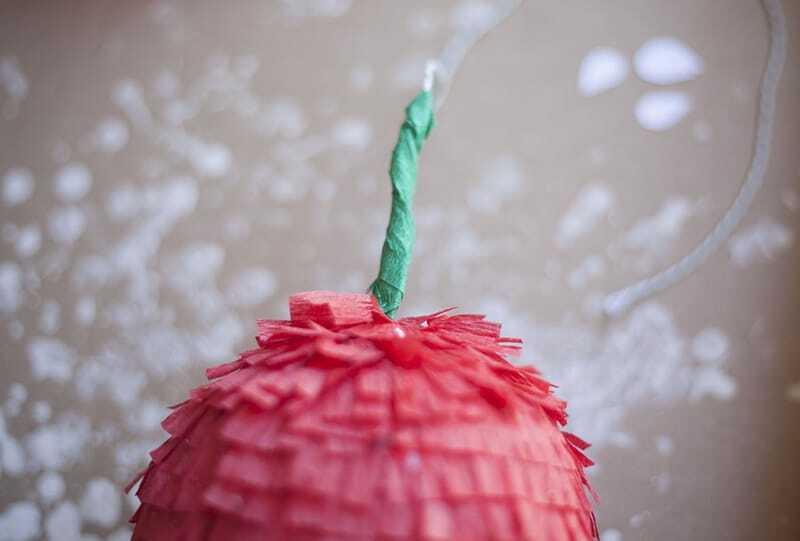 For our piñatas, we wanted to use pull string for opening so we cut a little door with a #11 blade. 7. 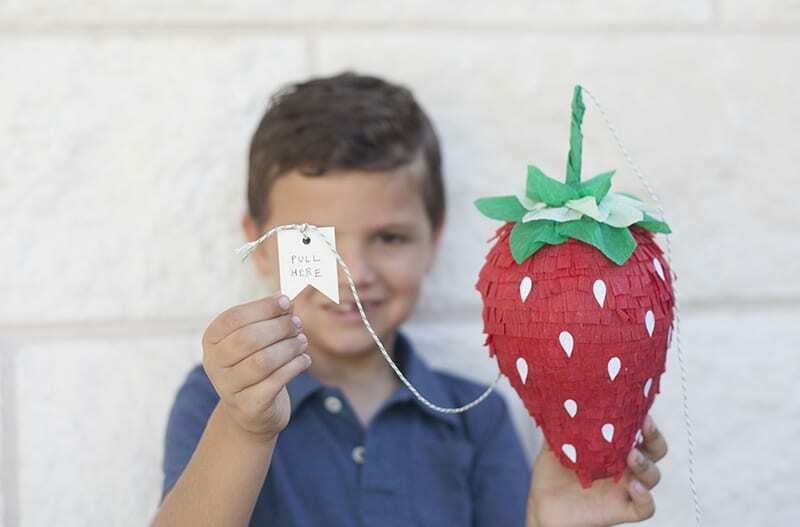 Now you should fill your piñata with age-appropriate gifts, party favors and treats. Maybe a Tom’s of Maine toothbrush (which is 99% plant based, cool right?) to go with those treats? 8. Then we cut a small hole in the door and tied a bit of baker’s twine around the edge. 9. 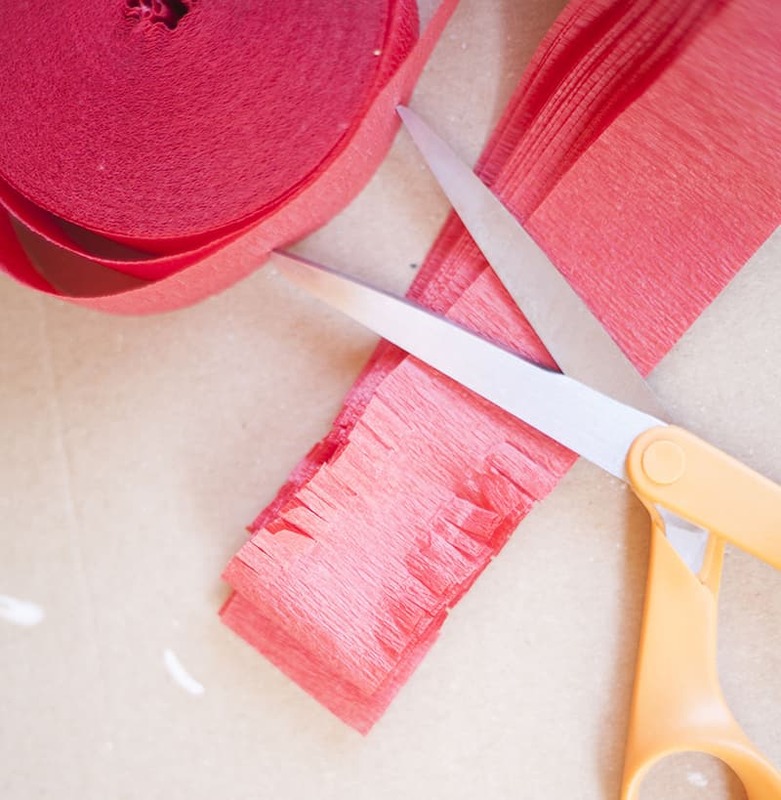 Set aside the piñata and double up a length of red (or pink) crepe paper streamers (some recycled gift tissue would work as well) as many times as your scissors can handle and cut fringe just a small bit along the edge. 11. 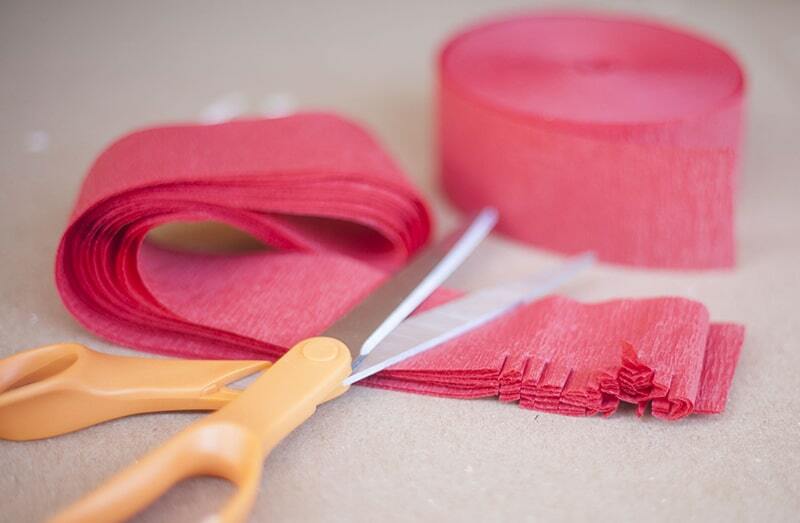 Cut down the middle of the folded streamer so that you have two narrow lengths of fringe. 12. 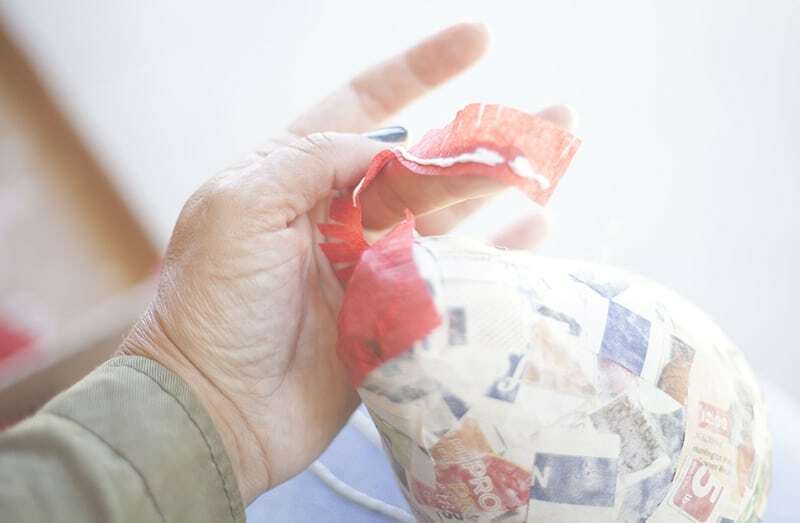 Patch the hole at the bottom with a square of paper and your favorite glue. 13. 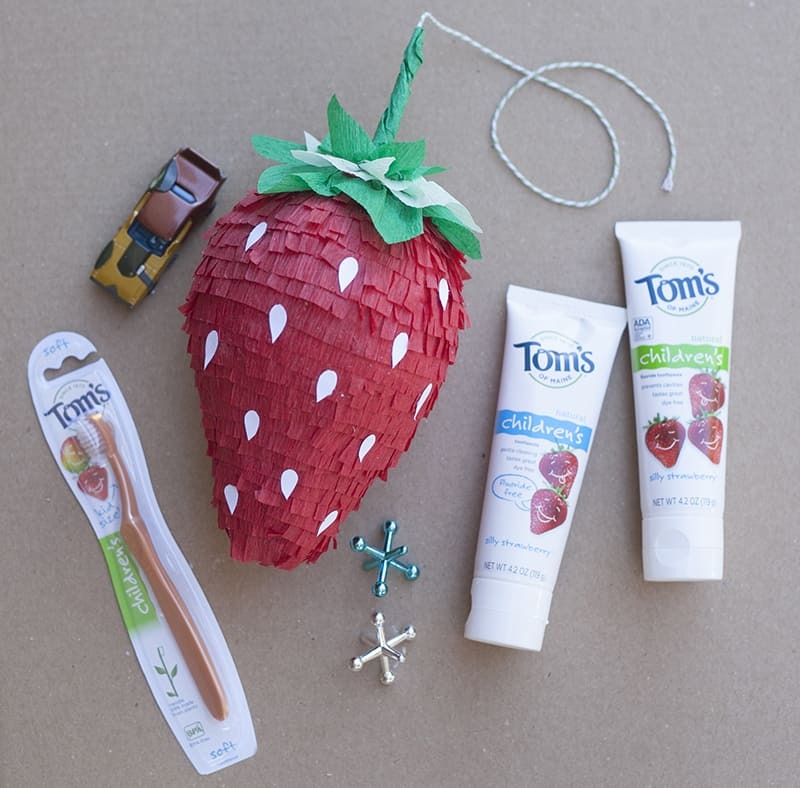 Gluing as you go, wrap the “strawberry” with fringe paper. 14. 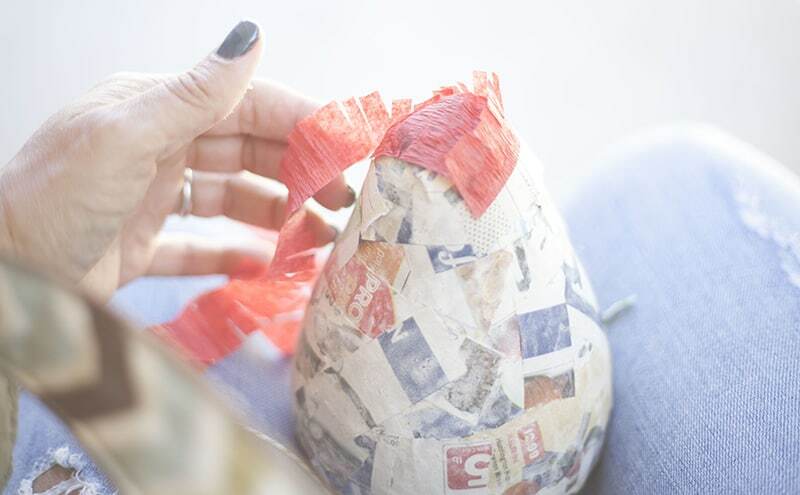 When you get to the “hatch” just keep wrapping, leaving the pull string dangling out. 15. 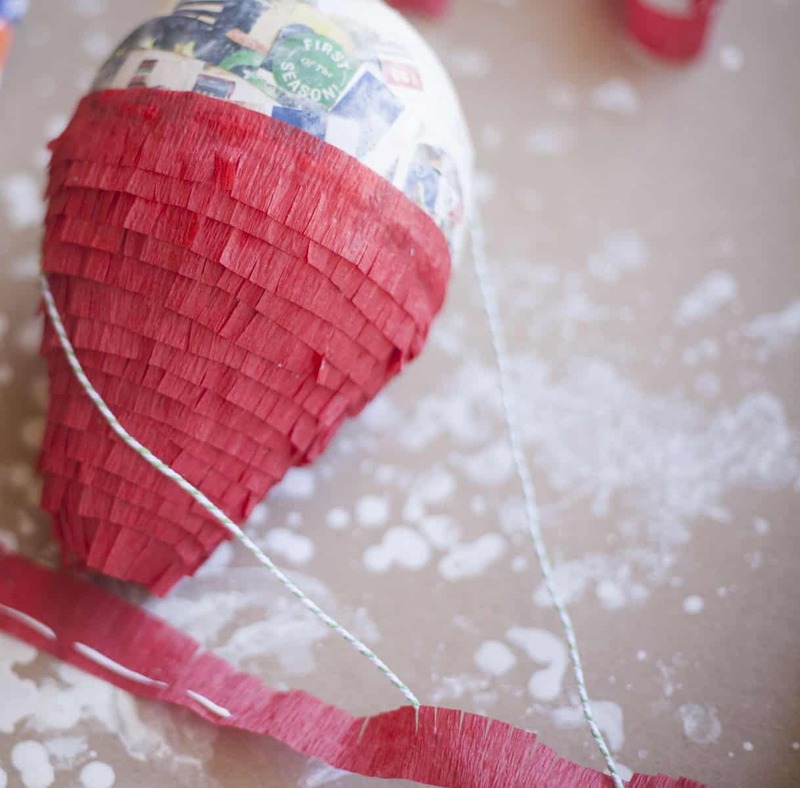 If you want to hang the piñata. secure a piece of string at the top. 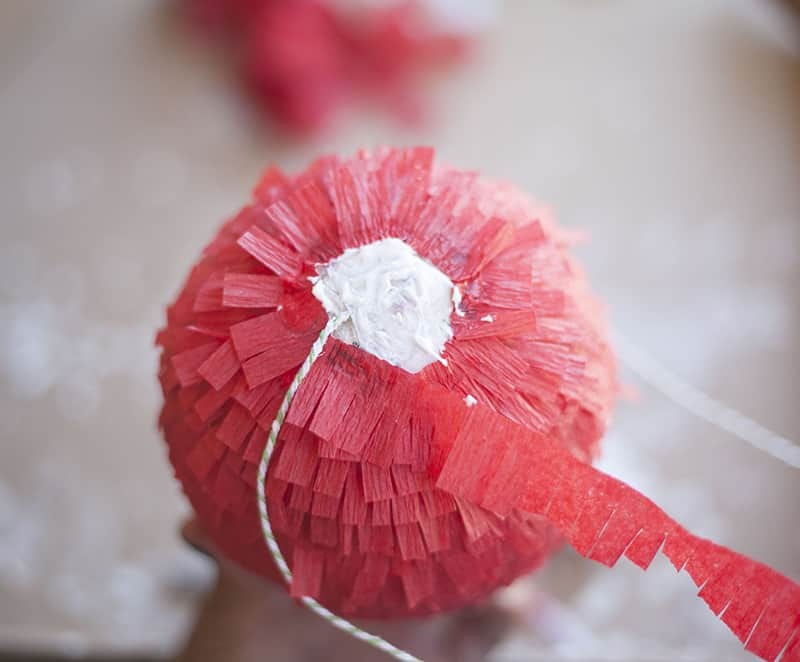 If your piñata is heavy, you may want to add duct tape, or even tie the string through the top of the piñata. 16. 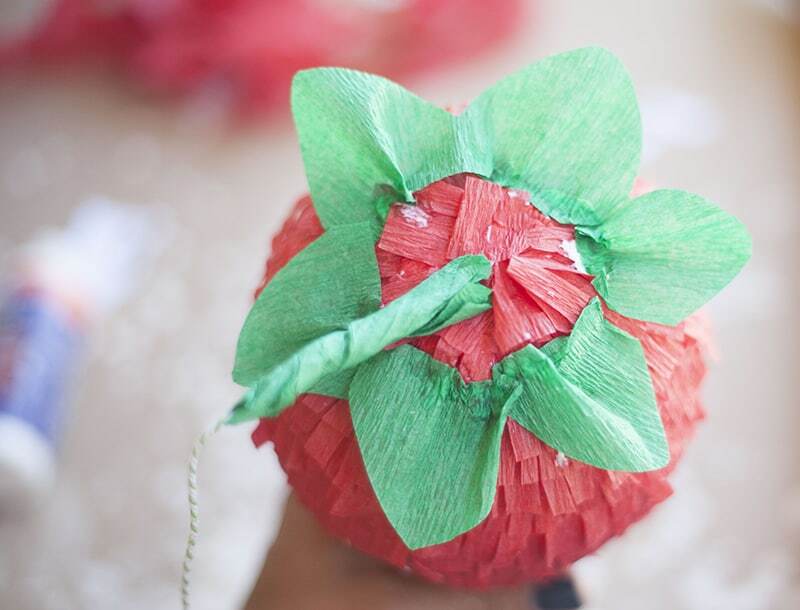 Once the piñata is covered, add a stem by twisting a folded up length of green crepe paper around the string. 17. 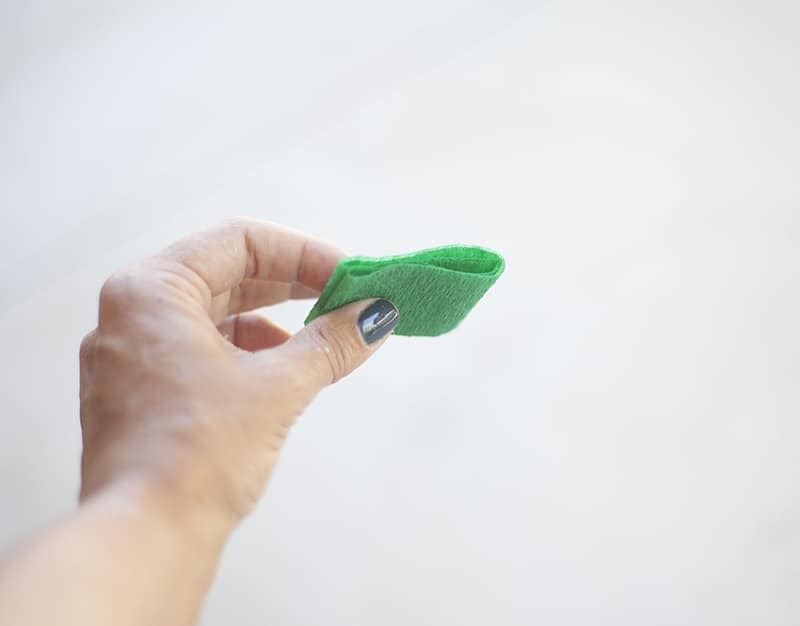 Fold 6 layers of green crepe paper into a square. 18. 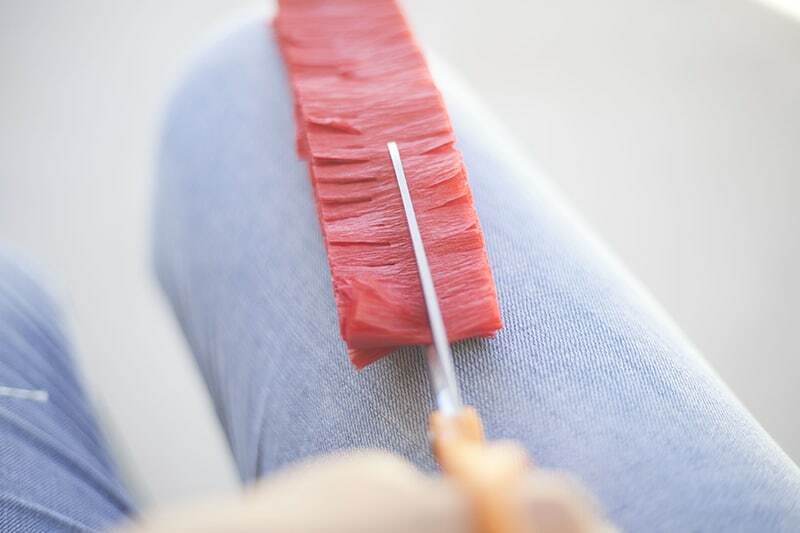 Cut the sides into a leaf shape. 19. 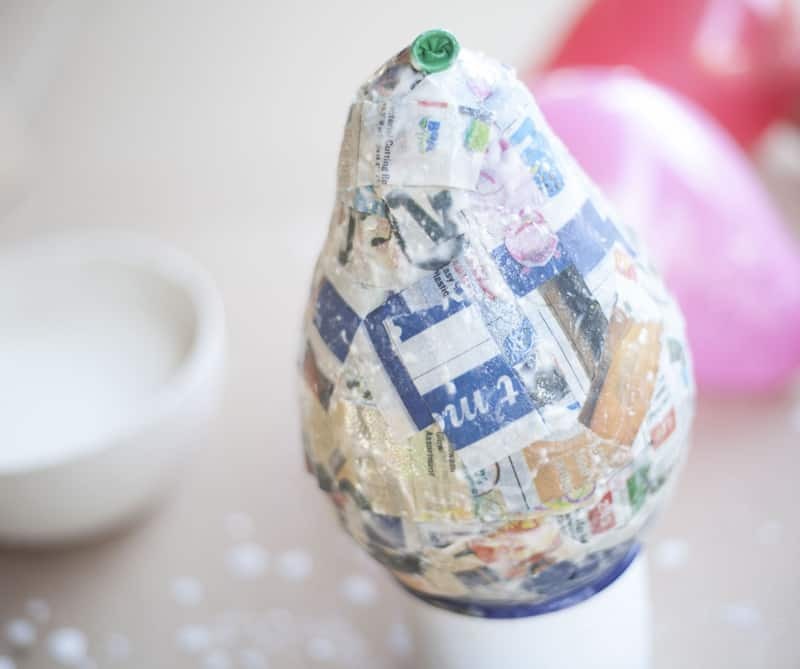 Add glue along the bottom. 20. 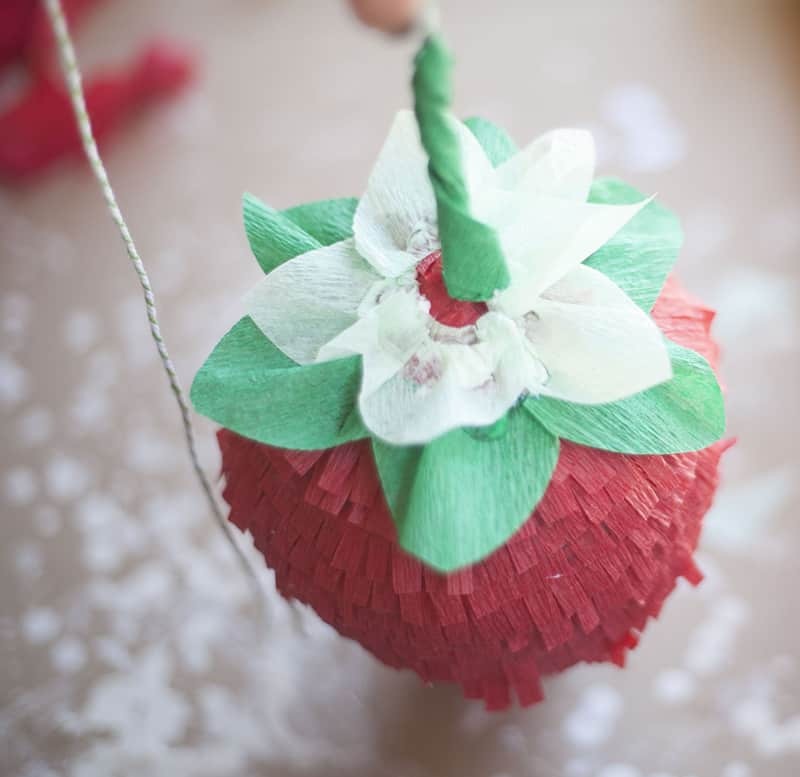 Pinching as you go, glue to the top of the DIY strawberry piñata. 21. Add two more layers of leaves around the top. 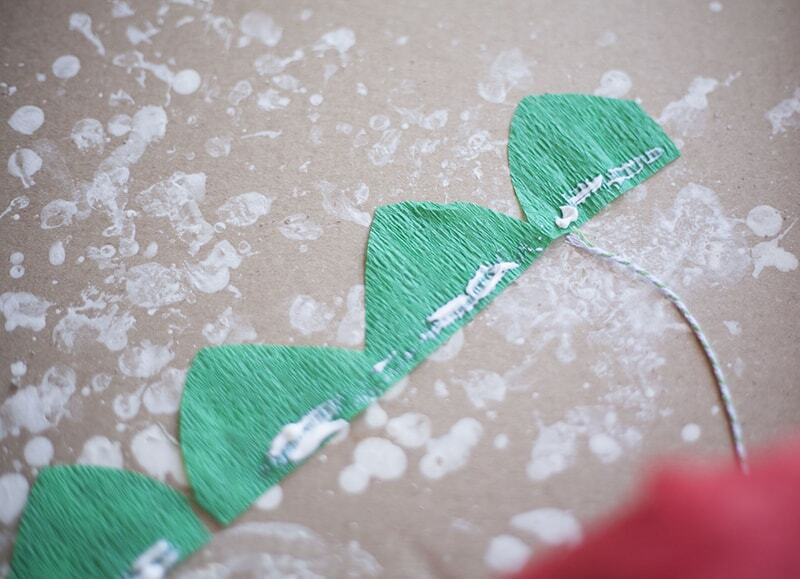 If you like the look of the seeds, cut some out of a scrap of white paper and add with a dab of glue. 23. 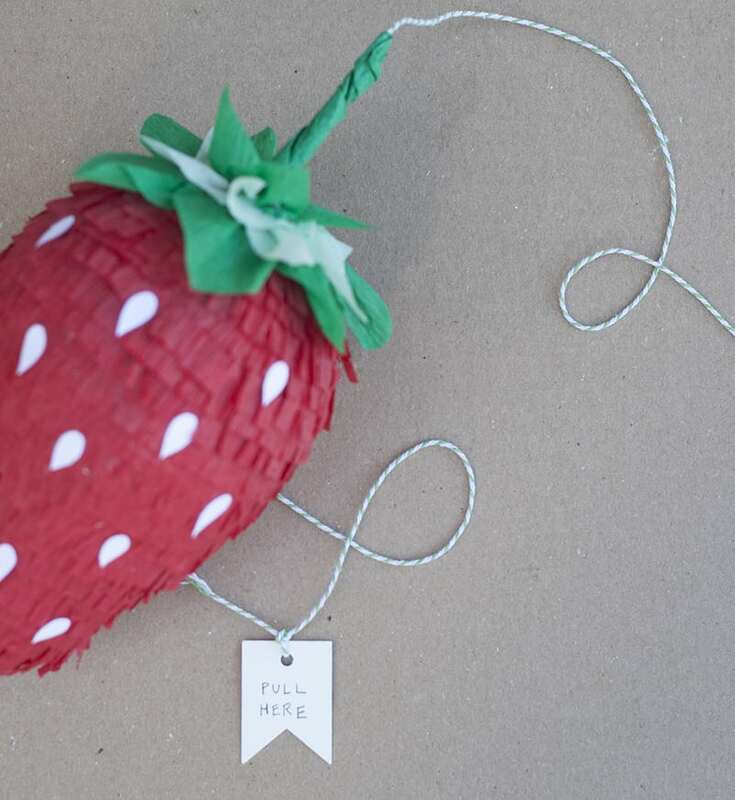 Watch those fun goodies spill out of your DIY Strawberry Piñata! This post is sponsored by Tom’s of Maine, a company we love and support. These are adorable! 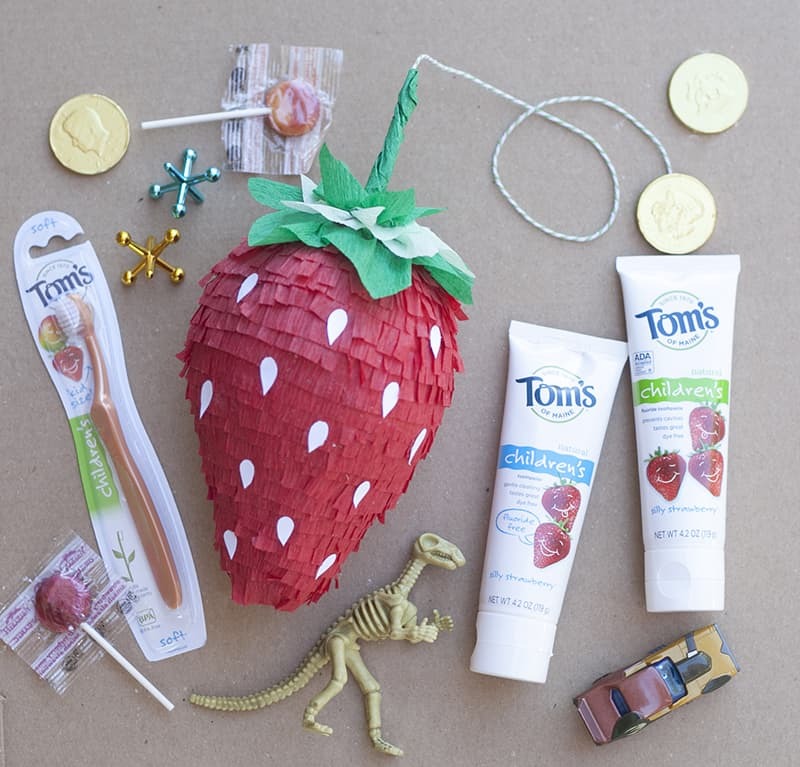 We also love the strawberry toothpaste. Wow! nice sharing. You made it very easy. I will surely try this out for my kids.